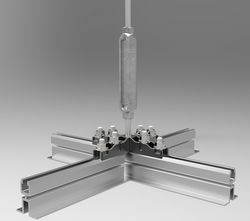 This new structural suspended ceiling solution is an engineered load bearing ceiling system that is both a suspended ceiling and a support grid in one cost effective solution. 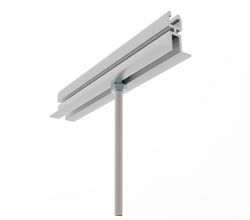 The system is based on a high grade aluminium extrusion with a M10 threaded slot along the entire grid which proves an easy way to add/remove equipment services whilst reducing labour costs. The design allows for hanging of various services such as busbar, lighting, cable trays, and security cages in the data centre. Furthermore, Flex-Grid allows the suspension of hot aisle containment plus chimney systems and at the same time it creates an upper air plenum for hot air return to the cooling handlers. The easy to fit ceiling tiles can be supplied in a variety of different sizes, colours and brands. With the ceiling panels in place you can easily create a hot air plenum when used in combination with a hot aisle containment or a chimney system. The ceiling panels can easily be secured to the grid. With all the equipment supported directly by the structural suspended ceiling, no struts or other supports will penetrate the ceiling panels, reducing dust and keeping air leakage to a minimum in the data centre. With the threaded slot in the grid extrusion, it is easy to add, change, or remove any installations of services, saving time, material and labour costs.